I really liked this one, who's threatening William Chalmers and why? The why turned out to be something I wouldn't have expected, and I liked how Janet stumbled upon the truth. William Chalmers ex-wife showing up gave the character a little more depth and I'm liking him more and more. More so than Edward, anyway. 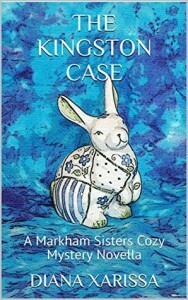 Very enjoyable and quick cozy to curl up with for an evening, and a wonderful murder-free series.